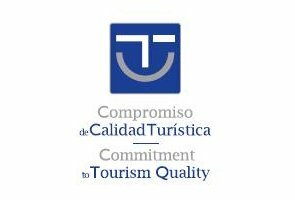 It is with pleasure and pride that we announce that Desert Springs Resort & Golf Club has been awarded by the Sistema Integral de Calidad Turística En Destino (SICTED) the distinction of “Commitment to Tourism Quality”. Promoted by the Ministry of Tourism with the support of the Spanish Federation of Municipalities and Provinces (FEMP), SICTED works with companies and touristic services throughout 32 categories of business that include; hotels, restaurants, sports facilities and public transportation to name but a few, with the objective to ensure the quality of touristic destinations and to guarantee the positive experience and satisfaction of its visiting tourists. Over an eight month period, Desert Springs Resort has been enrolled within the SICTED program and has now become one of only seven 18-Hole Golf Clubs out of the 201 in Spain that have been awarded the SICTED Distinction. The SICTED certification distinguishes those establishments that stand out for the quality of their facilities as much as the service provided in all aspects of interaction with the customer. In particular, Desert Springs Resort has been recognised for the quality of the superb Indiana golf course and it’s excellent practice facilities and standards of service provided to its guests, as well as the quality of the service and food provided within El Torrente restaurant. Additionally, SICTED has also awarded its Distinction to ‘The Lodge @ Desert Springs’ for the quality of it properties available to rent and the standards of service provided to our visitors. “These awards provide a true sense of pride for the entire team at Desert Springs Resort. They demonstrate recognition and confirmation to our business of our unwavering commitment to the delivery of excellence in not only our sports and leisure facilities provided for the enjoyment of all, but also the highest level of service the whole team at Desert Springs strive to deliver on a daily basis to all guests.